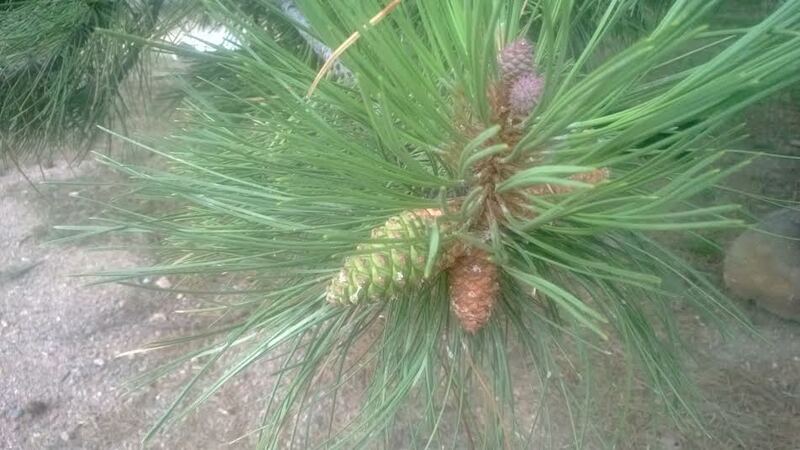 I visited Evergreen, Colorado, for the first time on July 25-27, 2014, and I had “the Evergreen experience” three ways. I was there for the Evergreen Jazz Festival — a weekend of delights. The second “Evergreen experience” escaped my camera because I was utterly unprepared. After a night of music at the EJF, I was sitting in my car in a parking lot — a very dark night — talking to the Beloved to tell her of the day’s events — and twenty or more immature elk trotted past the hood of the car. Of course it was the parking lot of the Elks’ Lodge, so I shouldn’t have been surprised, but I felt as if I’d witnessed a small Nature show for my benefit. The true “experiences” of that weekend (aside from lovely gracious new friends) were musical, provided generously by James Dapogny and the Chicago Jazz Band: Dapogny, piano / arrangements; Jon-Erik Kellso, trumpet; Chris Smith, trombone, vocal; Kim Cusack, clarinet, alto saxophone, vocal; Russ Whitman, clarinet, tenor, baritone saxophone; Rod McDonald, guitar; Dean Ross (a Denver native), string bass; Pete Siers, drums. Here they are — “asking the musical question,” twice. Gloriously. Thanks to Jeannie and Ted Mann and Jim Reiners for making it possible for me to have these inspiring experiences, musical and otherwise! 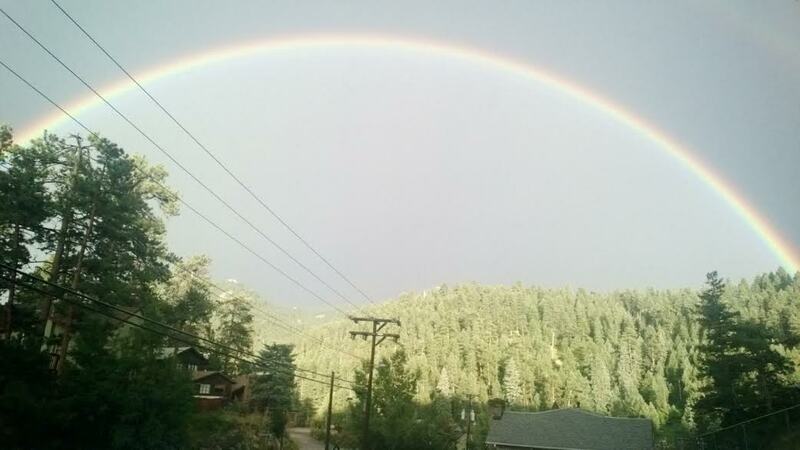 I will have more musical delights to share with you — but I hope to be back amidst elk, rainbows, and wonderful music in 2015. 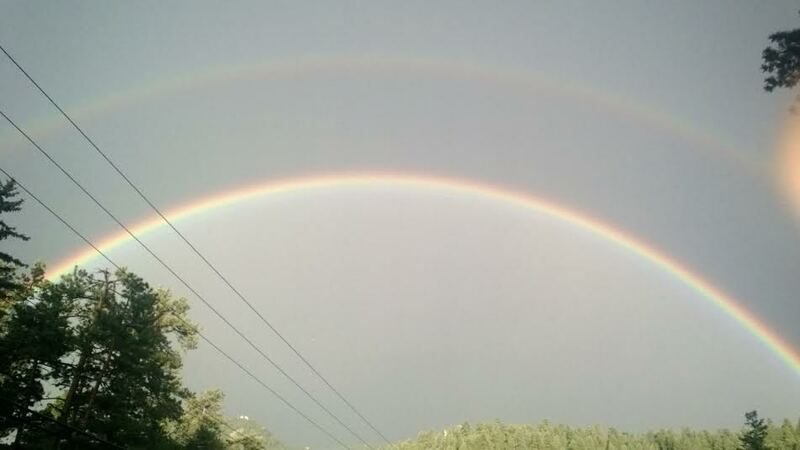 And perhaps you will join me at the Evergreen Jazz Festival, where rainbows proliferate, outdoors and in. I think it was an absolute honor to be there, and that this is unrivaled music. When I hear young jazz musicians playing, I always hope that they will record — so that their music can be heard beyond the small circle of people who will attend their live performances. 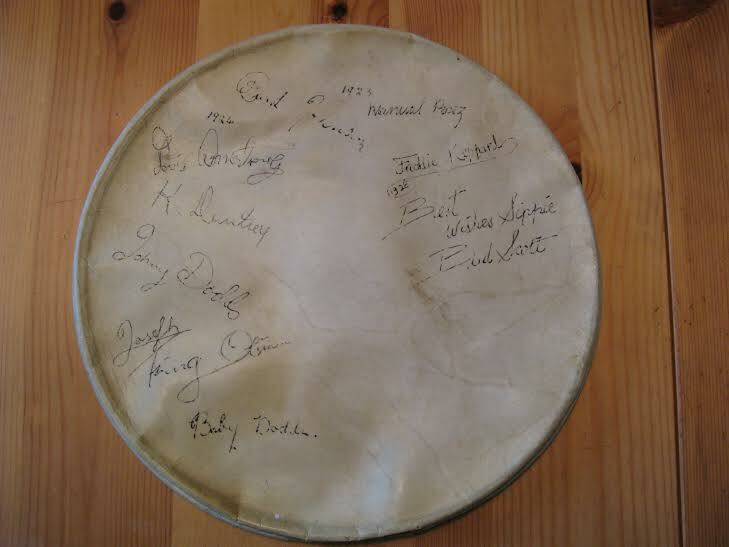 In London, there’s a small group (ever expanding) of lively young musicians — in this case, devoted to the hybrid of ragtime, popular song, and improvisations that were in the air in the first decades of the last century. 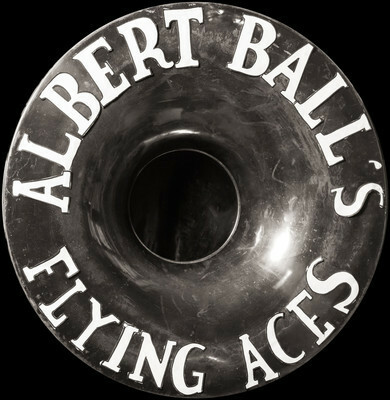 Their debut CD, ALBERT BALL’S FLYING ACES, asks the audience to imagine what might have happened if Ball, an actual pilot and musician who died in the Great War, had survived and formed a band when he came home. The music — played by young people with iPhones — echoes that lost generation who perished in World War One, and reflects lovingly on James Reese Europe, the Original Dixieland Jazz Band, and pretty melodies — both the ones of their time and ones newly composed to reflect that spirit. The music is at once nostalgic, reflective, and energetic. The musicians may not be familiar names to you — yet — but their work is impressive: Nicholas D. Ball, drums, percussion, vocal; Simon Marsh, reeds; Eleanor Smith, trombone, violin; Matt Redman, banjo, vocal; Richard “Dickie” Evans, sousaphone; Jonathan Butterfield, piano — with guest appearances by Patricia Hammond, vocal; Geoffrey Bartholomew, trumpet. 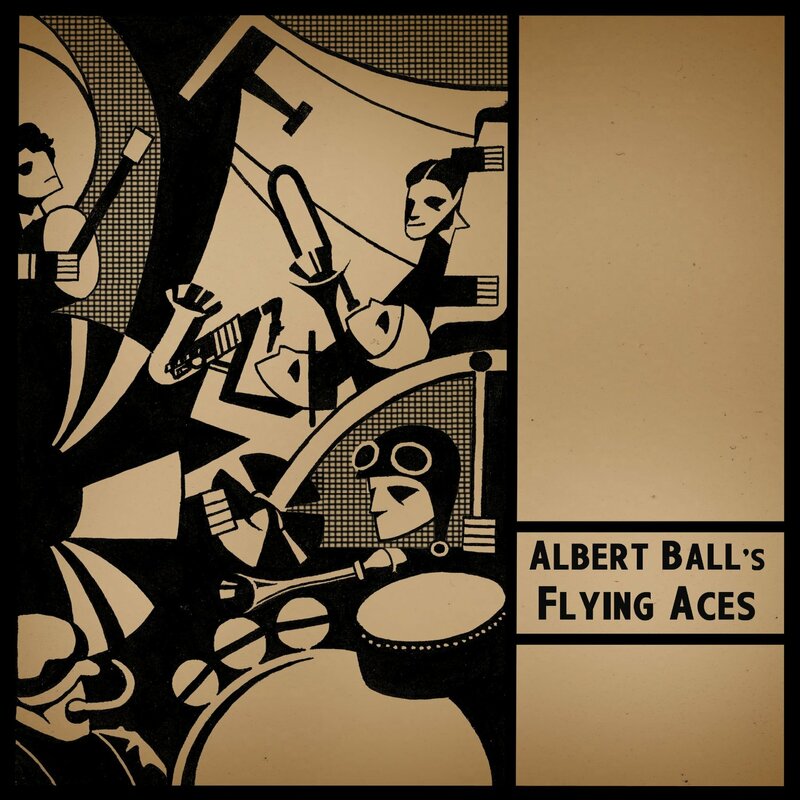 The songs are ON SILVERY WINGS OF SONG (2012) / THE AEROPLANE RAG (1912) / WHEN HAPPINESS REIGNS (c. 1920) / WAIT ‘TILL YOU GET THEM UP IN THE AIR, BOYS (1919) / PATCHES — A RAG-TIME DUET (c. 1916) / POOR BUTTERFLY (1916) / AFGHANISTAN — A ROMANCE OF ASIA (1919) / COMMON STROLL (2012) / THE FLYING CORPS RAG (2012) / WHAT DO YOU MEAN BY LOVING SOMEBODY ELSE? (1916) / SERENADE LYRIQUE — PICTURESQUE WALTZ (1899) / YOU’RE HERE AND I’M HERE (1914) / KEEP THE HOME FIRES BURNING (1914) / ROSES OF PICARDY (1916). You’ll note some new titles — composed by Members of the Ensemble, heartwarming favorites of the Great War, and compositions by Kern, Novello, Elgar, and von Tilzer. It’s much easier to ascend with the help of this band than it is to find a biplane in proper working order, so I commend them to you. And with fully modern means of communication! Here is their official site (a charming witty period piece). Mister Ball has also been granted a Facebook page for his band, and he has his own YouTube channel as well. As the crowning touch, the band’s CD can be obtained here. The Great War began a hundred years ago, but these Aces are still flying high. Two stories from the past. Jack Kapp, the head of Decca Records, was famous for wanting his artists — Bing Crosby, the Mills Brothers, the Boswell Sisters, Louis Armstrong, the Andrews Sisters — to play and sing the melody so that the ordinary listener knew it was there. Some sources say there was a wooden Indian at one end of the studio with a sign around its neck, WHERE’S THE MELODY? — others remember it as a picture of a Native American maiden with a cartoon balloon in which the same question was written in bold letters. Famously, Kapp has been depicted in recent years as a fierce oppressor, someone who chained his free-spirited artists to the black dots on the manuscript paper. It was all about the money, scholars propose, aiming music at the lowest common denominator who couldn’t understand anything they couldn’t hum along to. Jazz writers like to imagine “what would have happened if (fill in hero / heroine’s name) had been able to record for a more hip company. What magical music would we have now?” They shed tears for Louis Armstrong, “forced” to record Hawaiian songs with Andy Iona. I received a CD not long ago by a jazz group I hadn’t heard of, although their credentials and associations were impressive. And the CD had many beautiful songs on it — lovely melodies that I looked forward to hearing. When I put the CD on, I was immediately taken with the beautiful recorded sound, the expansive improvisations, the sophisticated technique of the players — no one seemed to take a breath; no one faltered; the improvisations — at the highest level — went on without a letup. But in each case, the improvisations were so technically dazzling, so dense with musical information that the song, hinted at in the first chorus, sank deeper and deeper under the water. Intricate rhythmic patterns, hammered out unceasingly; layers of substitute harmonies; unusual tempos (ballads taken at triple speed) dominated every performance. The disc lasted about an hour. It was brilliant and awe-inspiring but I found it truly exhausting and, to me, antithetical to the spirit of the original songs. I know, I know. Jazz is “about” improvisation, right? Only dullards play exactly what’s on the page, correct? I listened to the whole CD, and as much as I marveled at the technique, the assurance, the bold dash of the whole thing, all I wanted to do was to hear something beautiful, something songful and soulful. Ben Webster playing HOW LONG HAS THIS BEEN GOING ON? Louis playing and singing WHEN YOU’RE SMILING. Bird with Strings. A Johnny Hodges slow blues. Benny Goodman playing LADY BE GOOD. Miles Davis exploring the PORGY AND BESS score. I always agreed with the commonly held notion of Jack Kapp as a materialistic soul-destroying enemy of creativity. 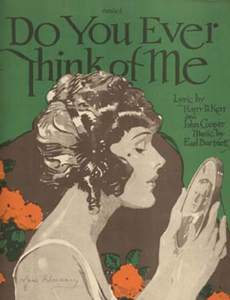 Now I might rethink my position, because beautifully playing the melody seems like balm to my ears. And I think that many musicians would say it is much more difficult to play that ballad “straight” and convey the song’s emotions than to leave the original behind in thirty-two bars in the name of improvisation. I hope you find beautiful melodies wherever you go. They are all around us. Tagged Andy Iona, Ben Webster, Benny Goodman, Bing Crosby, Boswell Sisters, Charlie Parker, Count Basie, Decca Records, improvisation, Jack Kapp, jazz, Jazz at the Philharmonic, Jazz Lives, Johnny Hodges, Lester Young, Louis Armstrong, melody, Michael Steinman, Miles Davis, Mills Brothers, WHERE'S THE MELODY? I smile at the person after this identifying statement and wait patiently. Sometimes the reaction is, “Oh, you like Miles?” and I can then explain that my heroes are Louis, Lester, and their living friends. But more often than not the response is polite silence. And a fixed look often comes over the other person’s face — somewhere between puzzled, being struck dumb, having nothing to say, wishing the subject had never been brought up, feeling ignorant, feeling threatened. which for a variety of reasons seems to leave people with nothing to say in return. I am willing and often able to converse on other subjects: the deliciousness of the food, the delights of Northern California, the other person’s interests, where the good places to eat are, how lovely or horrid the weather has been . . . the usual run of non-threatening conversation. But simply introduce JAZZ into the conversation and the room falls silent. Is it that people don’t like it, don’t understand it, and are thus reluctant to talk about something so esoteric, so outre? Really, I have no intention of holding forth about, say, an alternate take of an unissued Jabbo Smith 78 I have found after decades of searching. I am not going to lasso the New Person and force him or her to listen to me play THAT’S MY HOME (badly) on the cornet, or compel him or her to watch my latest YouTube clip. But someday I am going to try an experiment, and ask the Beloved to introduce me as a) someone who collects rare books; b) builds harpsichords; c) flies model airplanes; d) has a Lionel train setup in the basement; e) is learning the tango; f) rides an adult-size tricycle everywhere; g) just came back from a trip to Wisconsin . . . and see if the petrified stare comes out in the same way. I wonder what it is about JAZZ that produces such silence? Note: I have not written this post as an inducement for the cognoscenti to tell me how we are live in a cultural wasteland; how Americans are so stupid; how no one knows anything. Ranting about a current offense to taste is, to me, tedious. I don’t encourage angry contemptuous bashing here, and hope I have not been guilty of it myself. But it is — a la Yul Brynner — a puzzlement. This morning, I was driving across Manhattan to see the Beloved. Predictably, I was stuck in congealing traffic. I did what I often do (since the weather was fine and I wasn’t going anywhere fast) — put a new jazz CD in the player, opened my window, and turned up the sound. I assure you, should you worry, that my aging car’s sound system can do no harm to my or anyone else’s eardrums. As I inched forward, I saw a man on foot — what Chaucer might have described as a mendicant, someone in search of alms — going from car to car, peaceably. He was not intoxicated, untidy, or threatening. When he was several cars away, I reached into my trousers pocket to find a dollar to give him. When he came to my car window, I offered him the dollar, and said, “Here you are, my man,” and he took the bill and thanked me. But then something quite unexpected happened. He heard the music (a hot rendition of LOVE ME OR LEAVE ME by Bryan Shaw’s Hot Shots — a glorious new Arbors CD featuring Dan Barrett, Evan Arntzen, Ehud Asherie, Brad Roth, John Dominquez, Jeff Hamilton) and his face changed — from casual to intent. I turned up the volume and we listened, together, happily, for another half-chorus before the drivers in back of me grew restive. He was smiling. So was I. Music, surely, has charms. At the end of his day, the dollar I gave him is faceless, without personality: the minute or so of hot jazz we shared might have a much more lasting — and salutary — effect. Postscript: Since I abhor the names and styles and categories under which improvised music labors, I did not think it a useful expenditure of energy or love to be didactic, “No, my good man. ‘Dixieland’ can be defined as . . . . . What we are listening to is small-band swing / contemporary traditional / Mainstream . . . .” I leave that to others.